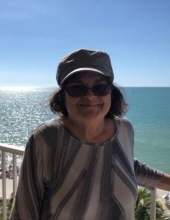 BROOKLYN - JoAnn (Marszalek) Nipula, 72, a resident of Brooklyn, CT passed away peacefully at home on November 11, 2018 after fighting a long and courageous battle with brain cancer for over two years. She was born on July 23, 1946, the daughter of the late John and Gertrude Marszalek. JoAnn was married to John Nipula, who predeceased her. She was his caretaker when he became ill.
JoAnn was employed for many years at Wyre Wynd in Jewett City. During her retirement years, she worked part-time at the Lisbon Walmart and enjoyed her time there. She is survived by her two children, Dennis Marszalek of Wauregan and Charlene Gadue of Griswold. She also leaves behind her two grandchildren, Jessica and Nicholas Gadue. She also leaves behind many friends, including her best friend, Noreen Crump, as well as her beloved cat Snoopy. JoAnn really enjoyed being a member of Jessica’s WAM Club and running snacks to the high school for Nick regularly. She loved her boating time on the water with Charlene and Glenn, especially when Nick was behind the wheel. Summer was her favorite time of the year. She looked forward to her morning visits from her son Dennis and his dog. There will be no calling hours. Funeral arrangements will be made private, but a celebration of her life will be announced at a later date. To send flowers or a remembrance gift to the family of JoAnn M. Nipula, please visit our Tribute Store. "Email Address" would like to share the life celebration of JoAnn M. Nipula. Click on the "link" to go to share a favorite memory or leave a condolence message for the family.